iOS7 now employes a slightly different way of accessing and managing what was once the multitasking tray. If you double click the home button now, you’ll be taking to what was once the tray that would pop up from the bottom. Instead, the homepage or app you’re in zooms out and you’ll be brought to a new screen of cards with icons at the bottom. Access your apps by swiping left or right and then tapping on the card. To remove apps from here now, instead of holding down the icon to bring up the “x,” you can now swipe each card upwards and that will completely close the app. 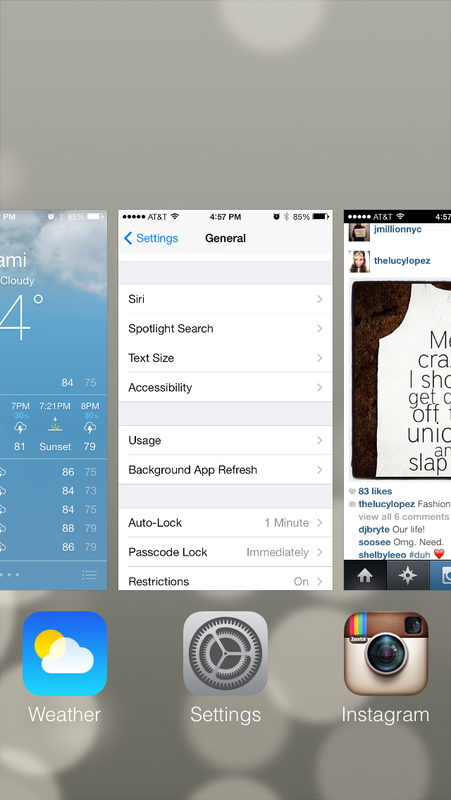 Apple’s new multitasking feature looks similar to how WebOS did multitasking. Now you can get a brief preview of the app you were in before and not just the little icon. It’s also much faster to switch between apps now in my opinion.